Gandhi's failure to secure commutation of Bhagat Singh's execution has provided his critics a convenient weapon to attack him. He has been accused of making half-hearted effort and even deception - for the alleged discrepancy between his actual role and his public statements. This paper attempts to establish that while following a consistent approach towards revolutionary violence, Gandhi tried his best to save the lives of Bhagat Singh and his colleagues till the last moment. The paper also discusses Gandhi's strategy to focus on suspension rather than commutation of the death sentence. Yashpal, a revolutionary colleague of Bhagat Singh and a bitter critic2 of Gandhi, wrote: “Gandhi considered it moral to put government pressure on the people for prohibition but he considered it immoral to put people’s pressure on foreign government to commute the sentences of Bhagat Singh etc.”3 Leftist scholar revolutionary, Manmathnath Gupta also bitterly attacked Mahatma Gandhi over the issue of Bhagat Singh. Another biographer of Bhagat Singh, G. S. Deol (1969), also held Mahatma Gandhi responsible for Bhagat Singh’s execution. Gandhi alone could have intervened effectively to save Bhagat Singh’s life. He did not, till the very last. Gandhi’s critics fail to understand that, he had more to gain by saving the lives of Bhagat Singh and his comrades, if it was possible, than the contrary. Gandhi was well aware that his failure to stop their execution will make the people in general and younger element of the Congress in particular, angry. Moreover, the executions would inevitably glorify the revolutionaries and popularise the ideals underlying the revolutionary violence and thus it will be a tactical setback in his fight with the forces favouring use of violence in the battle for swaraj. 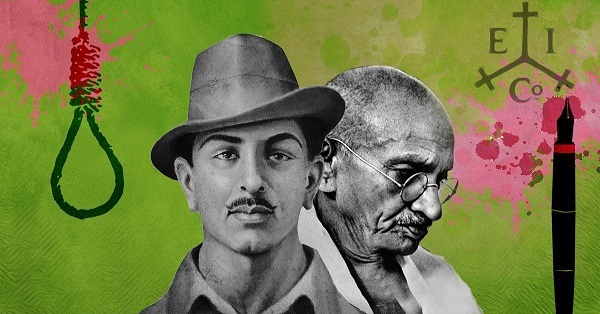 If Gandhi had succeeded in saving the lives of Bhagat Singh, Sukhdev and Raj guru, it would have been seen as the victory of nonviolence over violence and moral victory of Gandhi over the revolutionaries. A false impression has been created that Gandhi became interested in Bhagat Singh’s fate only a few weeks before his execution. As far back as 4 May 1930, a day before he was arrested, Gandhi had written to the Viceroy strongly criticizing him for the creation of the special Tribunal to try the revolutionaries in the Lahore Conspiracy Case: “You have found a short cut through the law’s delay in the matter of the trial of Bhagat Singh and others by doing away with the ordinary procedure. Coming to the tense events leading to 23rd March 1931, after the dismissal of the Petition for Special Leave to Appeal in the Privy Council on 11 February 1931, it became quite apparent that only an intervention by the Viceroy in the form of commutation alone could save the lives of the revolutionary trio. Gandhi-Irwin talks were round the corner. There was intense pressure on Gandhi from Congressmen and the general public alike to negotiate for Bhagat Singh’s life during his parleys with the Viceroy. The Working Committee had agreed with me in not making commutation a condition precedent to truce. I could therefore only mention it apart from the settlement. talked about Bhagat Singh. I told him, "This has no connection with our discussion, and it may even be inappropriate on my part to mention it. But if you want to make the present atmosphere more favourable, you should suspend Bhagat Singh's execution". The Viceroy liked this very much. He said "I am very grateful to you that you have put this thing before me in this manner. Commutation of sentence is a difficult thing, but suspension is certainly worth considering". Accounts by both Gandhi and Irwin make it amply clear that Gandhi asked for postponement or suspension of the execution and not the commutation. Gandhi has been criticised on this account. Was Gandhi interested only in postponement? Why did he make this move? Legally, (as Viceroy himself also admitted) after the Privy Council decision, Viceroy’s commutation stood no chance. That Congress leadership had already explored the legal aspect was admitted by Gandhi in a letter to C. Vijayaraghvachari dated 29 April 1931: “the legality of the convictions was discussed threadbare by jurists like Sir Tej Bahadur with the Viceroy and you know what great influence he had with him. But it was all of no avail…”11 Hence, in place of the commutation, Gandhi asked for the suspension of the sentences. Gandhi’s plan was to prolong the suspension and wait for a proper stage when a favourable environment was created in which he could ask for the remission of the sentences or even the release of the condemned revolutionaries. A secret part of Gandhi’s prolongation strategy was that he hoped to use the time in getting guarantee from the revolutionaries to shun violence if Bhagat Singh’s life is spared. Gandhi hoped to use this guarantee as a ‘carrot’ or a bargaining point with the British Government for the release of revolutionaries including Bhagat Singh. As he was leaving he asked if he might mention the case of Bhagat Singh, saying that he had seen in the press the intimation of his execution for March 24th. iii. That Congress would have been able legitimately to complain that they had been tricked by Government. On 20th March, Gandhi had a long conversation with Herbert Emerson, the Home Secretary. One of the last efforts of Gandhi to save the lives of the three revolutionaries was Asaf Ali’s mission to get an undertaking from Bhagat Singh and his colleagues in jail, asking the revolutionary party to shun violence. Such a declaration, it was felt, would strengthen the hands of Gandhi, in his final efforts to save the lives of Bhagat Singh and others.14 Details of this unsuccessful mission are reconstructed from the contemporary press. Lord Irwin, who carried the final authority regarding the executions, was still hesitating till the last day. Gandhi was certainly aware of Viceroy’s dilemma and so he redoubled his efforts to save Bhagat Singh and his comrades. Robert Bernays17 of News Chronicle (London), noted in his diary on 21st March 1931, “Gandhi is delaying his departure (for Karachi Congress) here another day for further conversation with the Viceroy”18 on the issue of Bhagat Singh’s execution. On 21st March, Gandhi met Irwin and again communicated his request for reconsideration of the impending executions.19 Gandhi met Irwin yet again on 22nd March to discuss the issue.20 The Viceroy promised to consider Gandhi’s submission. Sensing some hope, Gandhi wrote a personal letter on the morning of 23rd (Monday) to the Viceroy. In his final endeavour Gandhi tried his best to convince the Viceroy (addressing him as dear friend) for the commutation of the death sentence citing public opinion, internal peace, offer of revolutionaries to shed violence, his own position, the possibility of a judicial error and the appeal to the Christian sentiments of Lord Irwin. Mahatma’s efforts failed to bear fruit. 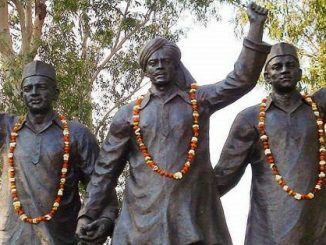 Bhagat Singh, Sukhdev and Raj guru were hanged the same evening at 7 p.m. As the news reached Gandhi, according to an eyewitness account, he was “visibly moved and deeply shocked“. Murder of Saunders and subsequent revolutionary actions had posed a direct challenge to the European civil servants serving in India. Huge popularity of Bhagat Singh only rubbed salt in their wounds. British civil servants were against all sorts of compromise with the anti-government movement. Intelligence reports of that period mention that Gandhi-Irwin agreement “disheartened and depressed them and all other supporters of Government; for they believed they saw in the truce evidence of lack of determination on the part of Government in the last resort to maintain its authority”.25 In the case of commutation of the death sentence of Bhagat Singh, Raj guru and Sukhdev, they sabotaged all efforts that could lead to commutation such as Asaf Ali’s mission. Suggestion of the Punjab Government to hang the trio before the Karachi session was a masterstroke as it left Irwin without a sound argument. But when they found that Irwin, was still vacillating they threatened to resign en masse. Gandhi’s efforts in the case of Bhagat Singh have been appreciated by his close associates like Sitaramayya, Mira Behn (Madeline Slade), Asaf Ali, and Aruna Asaf Ali. D. G. Tendulkar, Mahatma: Life of Mohandas Karam Chand Gandhi, Vol.Ill, 1930-34 (Delhi: Publication Division, Ministry of Information and Broadcasting, Government of India, 1961), p. 74. 2. One of his books was titled ‘Gandhivad Ki Shav Pariksha’ (Post-Mortem Examination of Gandhism). 3. Yashpal, Simhavalokan, (Allahabad: Lokabharati, 2005), pp. 404-405. 4. CWMG, Vol. X, p.112. 5. CWMG, Vol. XXXVIII, pp. 274-276. 6. CWMG, Vol. XLV, p. 273. 7. CWMG, Vol. XLV, p. 349. 8. CWMG, Vol. XLIII, p. 391. 9. CWMG, Vol. XLV, p.133. 10. CWMG, Vol. XLV, pp. 196-197. 11. CWMG, Vol. XLVI, pp. 51-52. 12. CWMG, Vol. XLV, pp. 315-316. 13. National Archives of India (N.A.I. ), Home Political File, 33/1 & KW, 1931. 14. Mahadev Desai’s diary (page 171) quoted by Anil Nauriya in Mainstream, April 6, 1996, p. 30. 15. Bhavisya, Allahabad, 27 March 1931. Also published in Snehlata Sehgal (Tr. ), op.cit. pp. 293-294. 16. Commonweal, Pune, 23 March 1949. 17. Bernays , a senior journalist, maintained a diary of his talks with a number of prominent Indian leaders and high ranking British officials. His diary, published in 1932, proved to be a sensitive and accurate chronicle of the events. 18. Robert Bernays, Naked Faquir, (New York: Henry Holt and Company, 1932), p. 213. 19. CWMG, Vol XLV, p. 320; Gandhi 1915-1948: A Detailed Chronology, compiled by C.B. Dalai, (New Delhi: Gandhi Peace Foundation, 1971), p. 87. 20. Gandhi 1915-1948: A Detailed Chronology, Ibid. 21. J.N.Sanyal, op. cit., p.74. 22. Aruna Asaf Ali, Fragments from the Past, Selected Writings and Speeches of Aruna Asaf Ali, (New Delhi: Patriot Publishers, 1989), p.102. 23. Homage to Martyrs, (Delhi: Shaheed Ardha Shatabdi Samaroh Samiti, 1981), Hindi Section, pp. 85-86; Robert Barnays, op. cit. pp. 211-212; C.S. Venu, Sirdar Bhagat Singh, 1931, Microfilm, N.A.I. , p. 48. 25. Terrorism in India, 1917-1936, 1937, p. 42. 26. N.A.I., Home Political File, 18/IV/1931, 1931. 27. V.N Datta’s keynote address at the International Conference on “Bhagat Singh and His Times” organised by the Indian Council of Historical Research in collaboration with the Institute of Punjab Studies, Chandigarh in September 2007. Excerpts from the address were published in The Tribune of December 23, 2007 under the title, Bhagat Singh Trial and Execution: Gandhi Tried His Best for Reprieve”. Datta has since revised and enlarged the address into a book-Gandhi and Bhagat Singh, (New Delhi: Rupa, 2008). 28. Amit Kumar Gupta, “The Executions of March 1931, Gandhi and Irwin”, Bengal: Past & Present, Vol. XC, (January- June 1971), pp. 111-112. 29. Shiv Varma , The Selected Writings of Shaheed Bhagat Singh, (Kanpur: Samajvadi Sahitya Sadan, 1996), pp. 132 – 133.